One of the most common questions I receive from students who want to work with clients as they approach graduation is, What can I legally do when I graduate from ACHS? The answer to this question varies for each holistic health modality. However, while facilitating a round-table discussion at the NANP Conference last spring, I was reminded how confusing it can be to navigate the legal waters of establishing a health practice as a holistic nutritionist or holistic nutrition consultant. There are still many U.S. states where a holistic health practitioner can be criminally charged with practicing medicine without a license for offering holistic modalities which can include aromatherapy, herbal medicine, and of course, holistic nutrition. I hope the “do’s” and “don’ts” of holistic nutrition will help you better understand what you can and cannot legally do as a holistic nutritionist. Recognize that health and wellness requires a holistic diet full of whole foods, fresh water, sunlight, exercise, and plenty of rest. Coach and educate clients about the tools to achieve and sustain good health such as daily routine involving whole, nutritious foods, exercise, and adequate sleep. Recognize when it is necessary to refer a client to his or her primary care physician for treatment and/or diagnosis. Empower clients to achieve improved health, both today and for the future, through addressing any imbalances caused by improper nutrition, poor quality sleep, insufficient water, lack of exercise, fresh air, and relaxation. Educate clients to evaluate their lifestyle choices, to identify and change any potential causes of ill health. Create healthy environments, conduct educational activities and demonstrations, and support clients to reach their personal wellness objectives. Diagnose disease: Without a medical degree and license to practice medicine, a holistic nutritionist or nutrition consultant cannot and should not diagnose disease. The goal of the holistic nutritionist is to educate their clients about holistic nutrition and empower them to apply this knowledge to their everyday lives. Prescribe drugs or pharmaceuticals: Again, the focus of a holistic nutritionist is education and empowerment. They teach clients about the benefits of herbs, essential oils, dietary supplements, and healthy nutrition, but they do not prescribe anything. Perform invasive procedures or touch therapies: Only licensed professionals can perform hands-on therapies such as massage, acupuncture, or other invasive procedures such as drawing blood or giving injections. Training to be a holistic nutritionist alone is not sufficient training to conduct hands-on therapies. However, a practitioner may also be trained as a hands-on therapist, such as a massage therapist, chiropractor, or osteopath, and use natural health modalities along with that discipline (for example, a massage therapist may use an essential oil blend to complement a massage treatment). Existing healthcare professionals should check with their licensing bodies regarding their scope of practice and how to incorporate new modalities into their existing practice. Cure disease: A holistic nutritionist does not focus on curing a client’s disease and never makes claims to “cure” or “treat” disease. This is a sure path to “practicing medicine without a license.” Instead, the holistic nutritionist focuses on educating a client with the tools and knowledge to take control of her own nutrition, health, and life to achieve a healthy balanced state, allowing the body to heal itself. For example, holistic nutrition graduates educate clients about healthy eating. A first step may be to recommend the client keep a food record for several days, then educating the client about the nutritional value of his or her diet to identify areas for improvement. For example, a food record may indicate that a client eats no fresh fruits or vegetables. It would be important to educate the client about why fresh fruits and vegetables are vital in the diet without making specific disease claims. The first statement—that fresh fruit and veggies cure cancer—is a disease claim that falls outside the scope of practice of a nutrition consultant. The second statement is a statement of fact that is well within the publicly available knowledge base. The bottom line: Without professional licensing, holistic nutritionists cannot diagnose, cure, treat, prescribe medication, or do any lab tests or invasive procedures, and this can lead to practicing medicine without a license. All right, enough of the scary stuff! While the idea of “legal backlash” certainly sounds frightening, it should in no way prevent you from achieving your goal of becoming a holistic nutritionist. You can still make a significant difference in the health of your clients through consultation, education, and empowering them to take control of their personal health and wellness, and of course by focusing on the “do’s” listed above. The Holistic Nutrition Certification Board (HNCB) provides you with added credibility by indicating to others that you have met the holistic nutrition educational and ethical standards required by a professional credentialing body. ACHS’s programs in holistic nutrition can prepare you for the certification exam. Your ACHS holistic nutrition program may also allow you to use the following designations in accordance with applicable state laws: Certified Nutritionist (CN), Nutrition Consultant (NC), Nutrition Educator (NE), or Registered Holistic Nutritionist (RHN). But don’t forget, it is extremely important to be aware of the most recent laws for holistic nutritionists in your state. Even if you reside in a state where you are not able to perform nutrition counseling unless licensed or exempt, you may still be able to provide general information about foods and supplements, methods of food preparation, nutrient data, and physiological mechanisms of action of dietary supplements to groups and/or individuals. I hope these “do’s" and "don’ts” have been helpful to you. 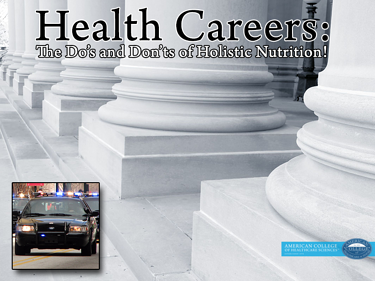 I would be happy to answer any questions about professions and education in holistic nutrition in the comments! Note this blog article is provided for general educational purposes only and is not intended to constitute legal advice. It is your responsibility to check with applicable state laws. You can read more about the do’s and don’ts for aromatherapists in my recent article, The Aroma of Choice: Aromatherapy and Health Freedom, on the NAHA Blog here. Note if you are currently working in a licensed profession it is your responsibility to check the scope of practice.